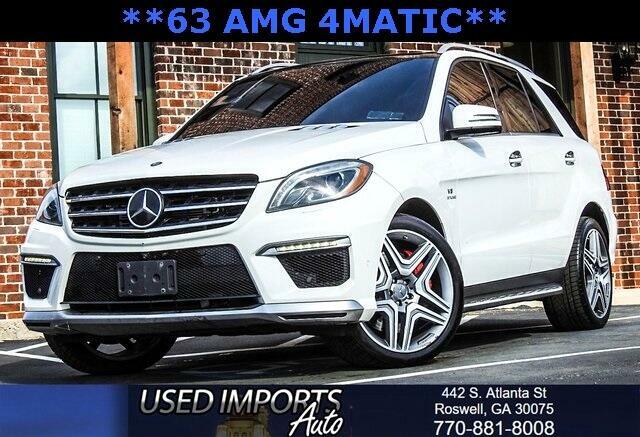 **63 AMG**FULLY LOADED**RARE PACKAGE w/ PANORAMIC SUNROOF**NAVIGATION**BACK UP CAM**360 CAM**DRIVER & PASSENGER MEMORY SEATS**HEATED/COOLED SEATS**AMG LEATHER SEATS**BLUETOOTH**BLUETOOTH AUDIO**USB CONNECT**STEERING WHEEL CONTROLS**MUST SEE**ALL POWER OPTIONS**PLUS SO MUCH MORE...Recent Arrival! 4MATIC® 4MATIC®, Black w/Leather Upholstery. * Every element of the 2014 M-Class cabin is thoughtfully engineered and elegantly crafted to make you feel at home, and in control, on any road. The standard 19-inch alloy wheels further accent the already stark design of the M-Class. Sleek and purposeful, the roof rails accommodate a variety of available accessory attachments for carrying bikes, surfboards, skis, snowboards and cargo carriers. Bright white LED Daytime Running Lamps help increase the visibility of your vehicle to oncoming traffic by illuminating front lights whenever the car is switched on. On the inside, wood trim adorns the console, dash, steering wheel and doors. The standard 4-spoke multifunction steering wheel is wrapped in supple Premium leather. MB-Tex upholstery offers a rich appearance and supple leather-like feel, even in cold weather. Electrically heated front seats quickly take the chill out of even the coldest day. 60/40 split-folding rear seat backs with flip-forward seat cushions allow for a truly flat cargo floor. The Cockpit Management and Data (COMAND) system features a high-resolution color-LCD display. This is utilized to manage audio, video, and other hands free calling and navigation functions. The M-Class features various engines, available at different packages, to suit your needs.